Joe is the founder and creator of CREATIVEBLOCH and has over 25 years experience as an artist, illustrator and Creative Director. He graduated RIT with a BFA in medical illustration and illustrated countless books, journals and magazine covers for various clients. Joe's highly textured acrylic paintings are known for their bold, expressive style. He created CREATIVEBLOCH art magazine, a publication for emerging and established contemporary artists. He is also the illustrator and author of "STICKY CITY" a new comic created entirely on the iPad Pro. Joe's work has been shown at CREATIVEBLOCH GALLERY, VAN DER PLAS GALLERY, CASTLE FITZJOHNS GALLERY, FILLIN GLOBAL and the BROOKLYN WATERFRONT ARTISTS COALITION. He has been active in showing through ARTINDUMBO events such as the DUMBO Open Studios, the DUMBO Arts Festival and First Thursday Gallery Walks. Joe's work recently appeared in HI-FRUCTOSE, BEAUTIFUL BIZARRE and HYPERALLERGIC. Joe creates vivid, highly-textured acrylic paintings that capture the raw psychoses of contemporary urban life on canvas. Although the work has an impressive artistic legacy from the Impressionist and Expressionist Eras, Bloch updates Van Gogh’s methods for the 21st century. His work depicts a jumble of slices of contemporary urban life through a somewhat macabre and humorous lens. In this way, Bloch addresses some of the same social concerns of the Expressionists, primarily the effect of industrialization and urbanization. In many of his works, huge towers spew noxious fumes into the air, corrupting skies that should have been blue. A sense of irony lightens the often dark mood that is conjured up looking at the work. The paintings are highly textured, with prominent brush strokes reminiscent of the works of Monet and the Impressionists in terms of methods. However, the powerful lines and colors of the paintings also channel certain elements of the Expressionists of the 20th century along with contemporary street artists. The thick outlining and use of vivid colors creates heightened versions of familiar places and things, making them to be unfamiliar, caricatures of themselves. In this way, Bloch creates a very specific emotional and psychological response rather than depicting the physical reality. The work encourages you to confront uncomfortable feelings that would otherwise be swept under the rug; these works have no obligation or intention of being "pleasing" in the conventional way. Furthermore, the exclusion of identifiable figures allows the works to transcend ethnicities and genders to create a purely visceral psychological response, much in the same way that Munch’s work does. Ultimately though, the critique of machines, technology and the city may be rooted in the 20th century ideology of Post-Modernism. The rockets, factories and tanks could be antagonists in these stories. While there is no visual mention of a possible solution to this urban condition, the critique itself questions whether man and industry can co-exist. Bloch seeks to discover if Post-Industrial gentrification can become Re-Industrialized without pre-fabricated luxury condos and boutiques. This forces viewers to question their current existence, lifestyle and superficial mindset. 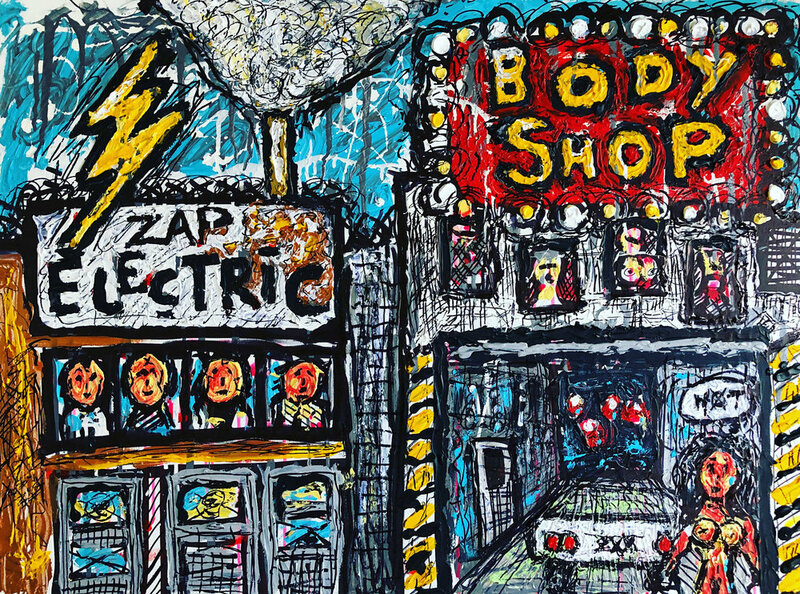 Bloch’s work is gritty and emotional, depicting the city as a modern industrial dystopia. Although not actual representation of New York City, the images are powerful, raw and thought-provoking. Just because the images do not coincide with the literal reality of the city, that does not make them inherently misleading-in fact, they may be more honest than we know. Joe's inspiration comes from many places including heavy metal, pop-culture, and classic painting fused with street art. Some of his contemporary favorites are Ron English, Derek Riggs, Mark Wilkinson, NYCHOS, Frank Netter, Eric Lacombe, and Chet Zar. Joe is also inspired by renowned painters such as Salvador Dali, Jean-Michel Basquiat, Vincent van Gogh, Georges Rouault, Paul Gauguin, and Edvard Munch. Joe has special admiration for Andy Warhol, Norman Rockwell, René Magritte, Henri de Toulouse-­Lautrec, Edward Hopper, and Georgia O'Keefe; artists who worked in advertising-----often maintaining dual careers for decades. DOWNLOAD INDUSTRIAL IGNESCENT! We take you behind the scenes in this 38 page digital download packed with paintings, photography, sketches and descriptions by Joe Bloch. Learn more about the inspiration and techniques used to create the art. DOWNLOAD the first official digital issue of STICKY CITY by Joe Bloch. (8 page PDF). All art created on the iPad Pro. STICKY CITY takes places in a hybrid age, somewhere in the past, present and future. You might see old establishments along side lurid characters from another time. Bright colors are used to express and capture a mood that brings viewers into another dimension. STICKY CITY is really inspired by NYC, but may or may not be recognizable to its viewers. A few places stand out such as Coffee Shop in Union Square, or a dim sum place in Chinatown, but most locations have been altered enough to slightly confuse and delight. Elements from original locations are mixed and upcycled into a new bizarre experience that is familiar yet totally unexpected. Inspiration comes from many places such as Spinal Tap, Taxi Driver, Pink Floyd the Wall, early Iron Maiden artwork, and Quentin Tarantino movies. Throw in some comic books, video games, a ton of pop-culture references along with dreams/nightmares and that is STICKY CITY. DOWNLOAD a copy of Joe Bloch's 22 page SKETCHBOOK/COLORING book! The PDF can be printed many times and colored in different ways! Includes sketches from various projects!